After a busy day, no one wants to come home and spend hours in the kitchen making a healthy meal, much less come up with a plan that feeds the entire family without any complaints. Between the prep, the cleanup and the actual cooking, feeding you and your family can feel like a full-time job — without the extra pay. 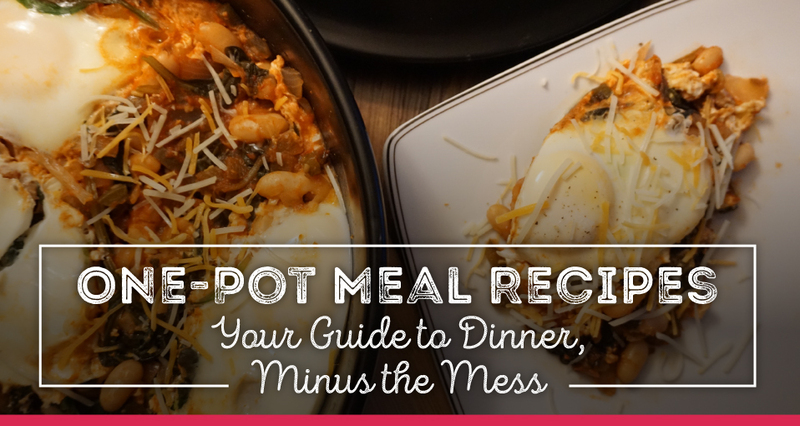 To help you out, we’ve put together a list of easy one-pot meal recipes that come together quickly, and won’t have you slaving away over dirty dishes well into the night. A beautiful blend of beets, potatoes and salmon, this colorful and easy-to-make dinner can be whipped up with lightning-fast speed and placed in one of our signature short-handled skillets for quick stovetop preparation. Serve this dish alongside some steamed greens and a loaf of good bread — a perfectly satisfying way to end a Tuesday, if you ask us. In a Dutch oven, add potatoes and beets. Add one tablespoon of oil and the water. Bring to a boil over medium-high heat, and cook for about 5-7 minutes. Drain any remaining liquid, and add garlic, onions, beets, potatoes, and salmon, coating the fish and vegetables with the remaining olive oil. Add rosemary, capers and fresh pepper, then place in the oven for about 15 minutes, or until the fish is fully cooked and flakes apart with a fork. While we’re used to whipping up a batch of pasta in a pot and all its delicious adornments on the side, this healthy one-pot meal puts everything together well before the pasta has even reached al dente status. This is the perfect hack for those nights when your family demands a hearty meal, but mustering the patience to make one isn’t exactly working out. In a Dutch oven, add linguini, sausages, tomatoes, garlic and basil with oil and water. Reduce heat to medium and let the mixture cook for about 10 minutes, or until all liquid has evaporated. You’ll want to stir the mixture frequently throughout the process. Remove from heat and drizzle with olive oil. Add salt and pepper, to taste, then garnish with freshly grated Parmesan cheese. Another take on the skillet, this veggie chorizo recipe can be easily made into a vegan dish, or even with real chorizo, if desired. This version gives eaters a balanced blend of ingredients — a little plant protein alongside some starch and no shortage of flavor. In a large skillet, heat olive oil over medium-high heat and sauté the potatoes and sweet potatoes for about five minutes, or until they become tender. Add soy chorizo to the skillet, breaking into pieces and stirring together with the potato mixture. Add remaining ingredients, and bring the liquid to a boil. Cover, and reduce heat to low. Let the mixture simmer on low for about half an hour. The liquid should be simmering the entire time. If it isn’t, bring heat up slightly. Once all liquid has been absorbed, sprinkle cheese over the top and allow it to melt while still on the stove. Remove from heat and serve. If desired, serve with salsa or guacamole. A simple dish with all the key elements of a balanced one-pan meal, right there on just one baking sheet. With tomatoes, basil and a little kick of pepper, chicken and cooked vegetables don’t need to be synonymous with a boring post-workout meal — plus, this one is ready in just under an hour. Bonus — we’re using aluminum foil here, so cleanup amounts to little more than tossing the sheet lining. Preheat oven to 400 degrees and line a rimmed baking sheet with aluminum foil. Use about half of the olive oil to drizzle the foil, then arrange chicken and cauliflower on the pan, placing chicken on one side and cauliflower on the other. Drizzle remaining olive oil over the top of the meat and veggies. In a separate bowl, add tomatoes, tomato sauce, crushed red pepper, minced garlic and bell pepper. Mix ingredients together then spread evenly over the top of both the chicken and cauliflower. Place in the oven and cook for about 30 minutes. After time has elapsed, test the chicken with a meat thermometer. The internal temperature should hit 165 degrees, minimum. If fully cooked, remove from oven. Squeeze lemon juice over the top, and garnish with the fresh basil. Breakfast for dinner doesn’t always mean pancakes, eggs or French toast at night. We’re bringing the North African brunch staple to the dinner table. This take on shakshuka is loaded with veggies, chickpeas, and of course, eggs — and is equal parts satisfying and practical for using up the myriad ingredients you weren’t quite sure how to use. In a large skillet, heat olive oil over medium-high heat, add onions and garlic and sauté until onions have become transparent. The whole process should take about 3 minutes. Add the bell pepper and jalapeños. Add tomatoes and tomato paste, along with the broth and spices. Simmer over medium heat for about 5 minutes. Stir in the chickpeas and spinach. Crack eggs over the mixture, trying to stay close to the outer edges of the skillet, and one in the center. Lower heat to medium and cover. You’ll want the eggs to cook over-easy, which should take between 10 and 15 minutes. Periodically check on the mixture, and lower heat if the sauce mixture seems to be reducing too quickly. Once egg whites have set, remove from heat and serve. As far as one-pan meals go, this one is easy, vegan and oh so tasty. Our favorite white bean ratatouille features a colorful cast of vegetables roasted to perfection, with some beans in the mix to keep things feeling substantial. Best of all, perhaps, is the minimal cleanup. Preheat the oven to 400 degrees. Meanwhile, combine all vegetables except the beans in a large skillet or roasting pan. Drizzle with the olive oil and roast in the oven for about 30 minutes. You’ll want to make sure the tomatoes have begun to transform into a sauce of sorts, then remove from the oven. Stir in white beans, rosemary and basil, and top with a little salt and pepper to taste. Place the skillet back into the oven and cook for an additional 10 minutes. Remove from heat and serve when ready. This recipe is great hot, but can also be served at room temperature. Cabbage, ground turkey meatballs and a delightful lineup of flavors round out this easy, one-pot version of Thai coconut soup. Our version is a little more stewed and can easily be served with some noodles or rice, or as a standalone dish — it’s your call. With an exciting assortment of spices, this dish will leave you satisfied and happy that you didn’t cave by ordering takeout again. In a Dutch oven, combine onion, cabbage, coconut milk, chicken stock and spices. Bring to a boil and reduce to a simmer. Meanwhile, combine ground meat with chili flakes, salt, pepper and dried rice. Mix thoroughly, and shape into balls about an inch and a quarter in diameter. This should make about 36 meatballs. Make them slightly larger, if desired. Add meatballs to soup mixture and cover. Let simmer for an additional 45 minutes. At this point, you’ll want to see if the cabbage has become tender and ensure the meatballs are cooked through. Remove the lid and let the soup cook for an additional 10-15 minutes, allowing the liquid to thicken a bit. Remove from heat and serve. You can serve this dish with rice or as soup. A fried rice dish with a kick and plenty of variation. This is the perfect “everything-but-the-kitchen-sink” dinner, ideal for those nights where it doesn’t seem like anything in the pantry can come together to make a cohesive meal, much less one that can feed the whole family and taste good at the same time. In a large skillet, add minced garlic and two tablespoons of the olive oil. Cook over medium-high heat for about two minutes, or until the garlic softens and becomes fragrant. Add cumin, paprika and cayenne, along with some salt and pepper, and stir into the garlic and olive oil mixture. Next, you’ll want to add the onions and cook for another minute. Add the brown rice and sauté for about three minutes. Next, add the chickpeas and kale, and let the whole mixture simmer on the stovetop for about 20 minutes, or until liquid has boiled down and rice has been fully cooked. Use your spatula to push the rice to one side of the skillet. Add the remainder of the olive oil, and carefully crack the two eggs into the skillet, avoiding the cooked rice. Scramble the eggs, and once they’re almost cooked all the way through, scramble into the rest of the dish. Having the right set of dishes in your kitchen rotation can make cooking feel less like a chore and more like a relaxing part of your daily life. At Ceramcor, our selection of short-handled skillets, Dutch ovens and more make it easy to make dinner without needing to take every kitchen implement out of the cupboard when mealtime rolls around. Transform the way you cook with our substantial collection of nonstick cookware.